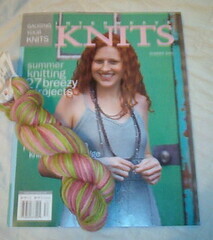 I got two skeins of Artyarns Supermerino in this springy pink and green colorway and the new Summer Interweave Knits. I thought I could sleep in this morning since I actually have the day off, but a storm came through and woke me up before 7 am. Oh well, so much for sleeping in!! Well, not much else. We're going to a wedding today... I'm debating if I should get my nails and toes done. Ooh, ooh, I forgot... I was bad.... I ordered some yarn for Alison's Nothin but a T-Shirt. 6 balls of Tinkerbell Rowan Calmer for the main color and 1 ball of Joy Calmer for the contrasting color. I can tell this is going to be a fun/challenging project for me! I also orderered another Rebecca Magazine because Knitting Garden never sent mine out, either that or it got lost in the mail, which I doubt. Oh well. I just know where I won't be ordering from again. Well, that's all ... really, that's it! Write more later, hopefully I'll be finished with my 2nd front of Gloria soon! I love the colorway of that Artyarns Supermerino! What are you thinking of knitting with it?